Created by a S.H.E. for a S.H.E., S.H.E.s Organized! is home on the Web for fans of Pam Young and Peggy Jones' Sidetracked Home Executives™ household management system. As outlined in the book Sidetracked Home Executives™: From Pigpen to Paradise, S.H.E.s organize their homes and tackle housecleaning with a simple--but powerful--tickler file. Using 3-by-5 index cards to plan and organize house cleaning chores, S.H.E.s bring peace, joy and order to their households. Read 21 Essays to S.H.E. Come on in, and welcome ... to S.H.E.s Organized! Welcome to the 21 Essays to S.H.E.™! In the essays that follow, we'll take a short course in how to set up and use a Sidetracked Home Executives card file for better home organization. Cardfile Tour: Blackflipflop's SHE Card System! Ready for a REAL tour of a working S.H.E. cardfile? Check this blog post from Virginia at Blackflipflops Designs! With a complete photo tour, Virginia explains how she uses the Sidetracked Home Executives cardfile system to organize her home and her life. We love, love, LOVE this blogger's account of her 24-year progress through the SHE system, from cardfile to Flykid. Not only is it a wonderful account of one SHE's journey to better home organization, it also tracks nearly 20 years of SHEs on the Web! SHE Joyful Housewife Has A Clean House! Ready to see a real-world working SHE cardfile system? 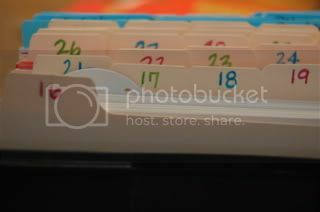 Check out this cardfile tour from blogger 50s Housewife. With five children, she's developed a hands-on home management system that works.